The Torpedo Bait Bucket ™ is made of UV stabilized polypropylene, the same popular material used in applications where a tough, sunlight-resistant plastic is required, like automobile trim and portable gasoline containers. We used a light blue sky color to make the bucket as invisible as possible from an underwater viewpoint. After all, a major benefit of kayak fishing is stealth. The bucket is 21 inches long and 4.5 inches wide, and holds bait and water when in an upright position. When transporting in a vehicle it might be best to hang the bucket from something so it won’t tip over. When in the kayak just tether it to a short lead. It has a floating rope handle. If fishing in hot sun push down on the top to remove air and the bucket will stay submerged to keep the bait cooler. A few months ago I was given a Torpedo Bait Bucket to review. Let me start out by saying, I generally don’t use live bait. So, I was a little apprehensive about this product. However, I had been contemplating a DIY live well for those near shore trips, which is about the only time I use live bait. I figured this might be just the thing to replace the need for a live well. I like simple. The Torpedo Bait Bucket is the epitome of simple. There are no batteries, etc. that I need to worry about on the water. 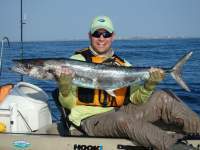 All I had to do was put the baitfish or shrimp in the tube, put the tube in the water, tie it off the side of the kayak, and I was in business. 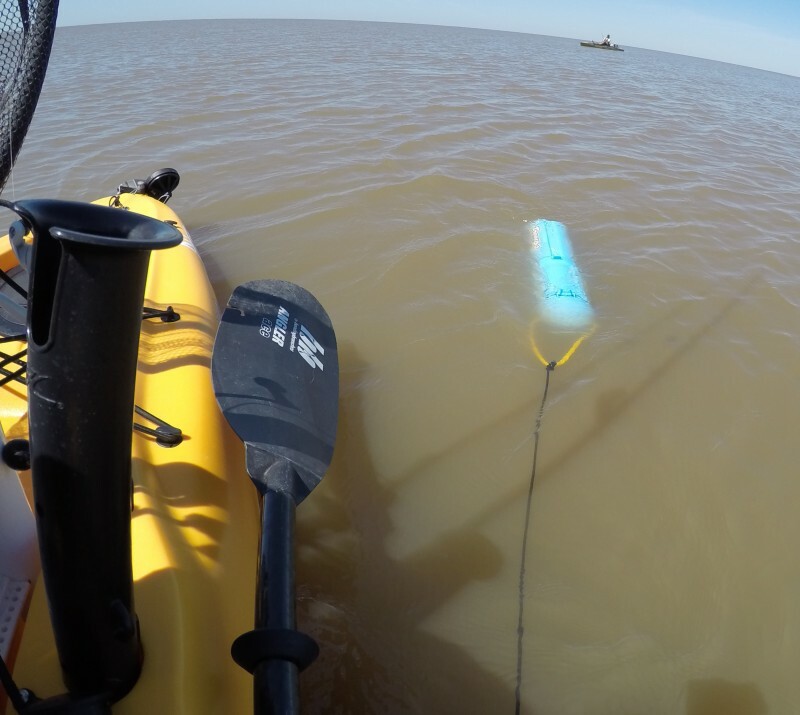 I know there are people who have wondered, including myself, about the drag the Torpedo Bait Bucket will cause while pulling it beside the kayak. Let’s face it; anything you pull in the kayak will cause a drag. However, I believe the design of this product limits the drag as much as possible. 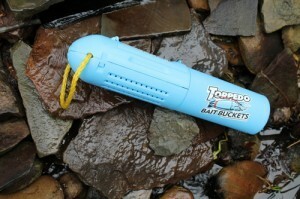 The Torpedo Bait Bucket is shaped like a bullet, which allows it to cut through the water as best as possible. 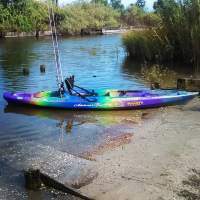 Honestly, I did not notice the drag very much while pedaling my Hobie Outback. I can’t say for sure but I it may be felt more by those who are paddling. I suppose the drag is a trade off for the added water weight of a live well. One thing I had to be cautious of was the rope I used to tie off the bait tube. Initially, I used a long portion but found that it was able to get hung underneath my rudder. It was an easy fix; I just shortened the length. Another issue I had to be aware of was the fact fish always tend to find something to get tangled in. The rope to fasten the Torpedo was no different. At one point, I had a fish next to the kayak and he started to roll around and did get tangled in the rope. Not to much of a problem, I just found I needed to be more careful and conscientious about where and how I brought the fish in. The absolute best thing about the Torpedo Bait Bucket is that it keeps live bait alive. On one trip, I had baitfish and shrimp in it for about seven hours. At the end of the trip, everything was alive. This to me was impressive. I have used live wells in boats before that was unable to keep everything alive for that long of a time period. Although I was initially apprehensive about this product, I will say that overall I am impressed with it. It is very simple and most importantly, it works! And at only $29 dollars, it is a great alternative to live wells and even those DIY solutions that are out there. The pros of this product greatly outweigh the cons. As for me, I will definitely use this product for those trips where live baitfish is a must, especially for near shore fishing. "I absolutely love using these reels. I have the 7:1:1 ratio because I mainly frog fish. It's really fast and smooth. ..."
"These really are by far the best guides on the market right now. They really do live up to all their claims. Better accuracy, distance,..."
"You’re definitely getting more than what you paid for. The loop that is attached to the lure is small but attached well so you don't..."